Since 1991, Mortgages Unlimited, Inc, has been providing home loans on 1 to 4 unit residential homes to people throughout Minnesota, Wisconsin, and South Dakota. As the actual lender, we can close faster, and streamline the process better than most banks, and real estate office in house lenders. We also offer a complete line of mortgage loan options, so whatever your need, we probably offer it. Mortgages Unlimited has a Better Business Bureau A+ rating, and consistently received awards and recognitions as the best in the business. 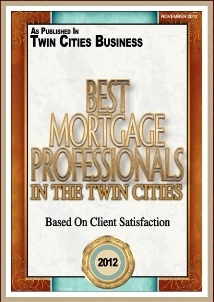 In 2012, Minneapolis - St Paul Business Magazine named Mortgages Unlimited "Best Mortgage Professionals in the Twin Cities" - based on Customer Satisfaction. This is because we treat each customer as an individual, not a number. We don't just take applications. We take the time to ask the right questions, listen to your needs, then design a mortgage loan program that fits you and your family. Sure, there are dozens of big banks and national mortgage companies who offer home loans. But what you really need is a local, Twin Cities based mortgage lender. Why? Because we live and work here. We have a local reputation to uphold. We know Minneapolis, St Paul, Duluth, Rochester, Madison, Milwaukee, Green Bay, Pierre, Sioux Falls, Mitchell, Aberdeen, and surrounding areas. We know the Real Estate Agents, appraisers, inspectors, and so much more who work these areas..
Don't gamble your families largest financial transaction on some out-state lender and an unlicensed telemarketing Loan Officer at some call center that may not even know where to find the Twin Cities on a map! We work with many, many investors, and continually analyze the market for competitive loan programs, and interest rates. This allows us to get you the best rates on all types of loan programs including: 30 year or 15 year fixed rate mortgages, 1/3/5 year ARMS, Conventional, Jumbo, FHA loans, USDA loans, and VA loans . Talk to our mortgage experts today - Call (651) 552-3681. Experience why we we rated the Best Mortgage Professionals in the Twin Cities.